We are engaged in manufacturing and supplying optimum quality used lathe machine, which is also available in customized finishes with the individual application requirements. Spindle bore : 48 mm No. We are manufacturer and supplier of Drill Machines, Lathe Machines, Planner Machines, shaper Machines, Boring Machines, Hacksaw Machines, Power Press Machines etc. Incepted in the year 1967, we “Sarab Machine Tools are an affluent manufacturer of a wide array of Radial Drilling Machines, Milling Machines, Shaping Machines, Sheet Rolling Machines, Surface Grinding Machines, etc. We are proud to be counted among the distinguished supplier of an unrivaled range of Used CNC Lathe Machine. In order to fulfill various demands of our esteemed clients, we are engaged in providing an array of Used Lathe Machine. - Used for taper turning operation. 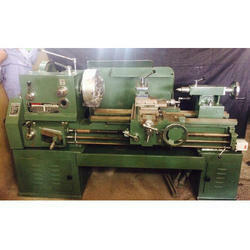 We deal in Automatic Used Heavy Duty Lathe Machine.